Who Is the Nights King, the White Walkers Leader on Last Nights Game of Thrones? Who Is the ‘Night’s King,’ the White Walkers’ Leader on Last Night’s Game of Thrones? Pour one out for the Wildlings of Hardhome. On last night’s episode of Game of Thrones, the refugees from last season’s battle at the Wall encountered something far worse than a couple of crows: an army of the dead, led by the freaky spike-headed White Walker we first saw turning a baby into a blue-eyed monster last season. Turns out that when it comes to conversion, this guy is the ice-zombie version of the Reverend Sun Myung Moon, as the final moments of Sunday’s episode saw him raise hundreds of Wildlings from the dead with the world’s most ominous ¯\_(ツ)_/¯ gesture. So who is this dude, exactly? For hints, we have to go back to last year, when HBO Go accidentally revealed this character’s name: “The Night’s King.” For book fans, it was a major reveal. In the Game of Thrones novels, the Night’s King has a long history; he exists at the earliest fringes of Westerosi history, like a fantastical Gilgamesh. According to legend, the Night’s King was the 13th Lord Commander of the Night’s Watch — for a sense of the time scale, Jon Snow is the 998th — who found a mysterious woman beyond the Wall. She had “skin as white as the moon and eyes like blue stars,” and the Lord Commander was instantly smitten. Was she a White Walker? A wight? Something else entirely? Whatever her true nature, loving her cost the Lord Commander his soul. He brought her back to the Wall, crowned himself the Night’s King, and the pair ruled for 13 years at the Nightfort (the abandoned castle where Bran crossed paths with Sam in season three), performing dreadful sacrifices and other dark magic. Eventually, the Wildlings and the Starks teamed up to end his reign of terror, and afterwards removed all traces of him from the historical record. Even now, Northerners debate the Night’s King’s real name; some say he was a Bolton (typical), some say he was an Umber, but in the spooky stories told at Winterfell before its fall, the tellers swear he was a Stark. This idea, predictably, freaks out the Stark kids. That legend is the only time the Night’s King pops up in the books, but if we are to believe the credits, he apparently survived his own downfall and managed to escape to the Lands of Always Winter, where he became the leader of the White Walkers. Almost a promotion, really! (This is assuming, of course, that the Night’s King from the books and the Night’s King from the show are the same figure. It’s possible, but much less interesting, that the show merely swiped the Night’s King name because it sounded cool. Maybe the Night’s King is also a title that’s passed down from generation to generation, like Lord Commander.) 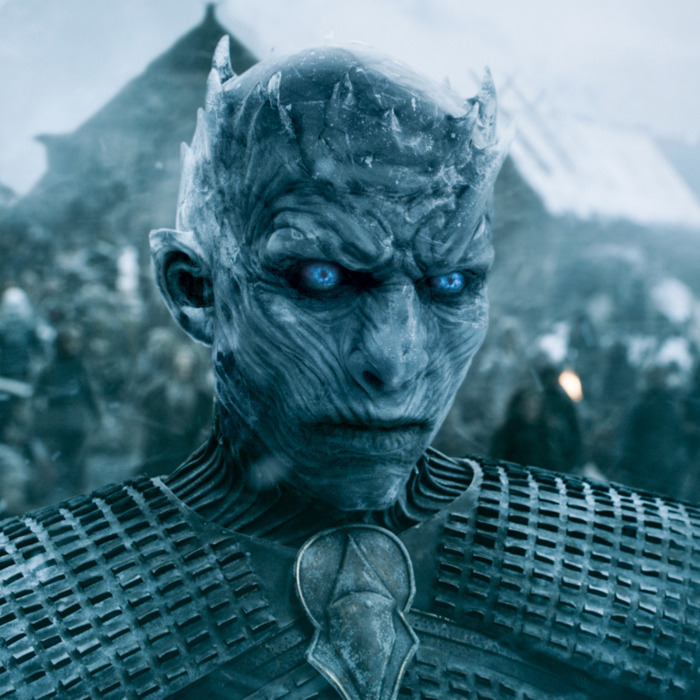 As we saw last year, the Night’s King, apparently, is the White Walker in charge of creating new White Walkers, and last night’s episode also implied that he’s the one who raises the army of undead wights the Walkers use to do their bidding. (A lot of people have trouble with this, so here’s a quick clarification: White Walkers are the blue guys with white hair you kill with dragonglass or Valyrian steel; wights are the corpses with blue eyes you kill with fire. Both can be accurately described as “ice zombies,” though, unlike our traditional understanding of zombies, White Walkers have consciousness.) However, it’s possible that other White Walkers can raise the dead, too, and that the Night’s King just did it en masse last night to be dramatic. Say what you will about White Walkers, they know how to create a spectacle. So, why is he so interested in Jon? This is where book knowledge fails us, and we have to resort to pure speculation. Maybe he saw another Lord Commander, and got a wistful reminder of his former life. Maybe he knows that Jon is living out a Hero’s Journey arc, and he senses the boy has a Special Destiny. Maybe, as a Stark himself, he can sense when someone has Stark blood. Maybe he saw Wildlings and Northerners fighting together, once again, and was reminded of the forces that brought about his own downfall. These are all good possibilities, and if you’re a book reader, you know the Night’s King could have a part to play in the situation at the Wall after A Dance With Dragons. Whatever the reason, this much is clear: Winter is coming, and we now know who’s leading it. Who the Heck Is GOT’s Night’s King?